Get a watch that gives you more with Fitbit Ionic - a motivating new timepiece packed with fitness guidance, smart experiences, music storage, apps, payments and more. Work out in a whole new way with personalised on-screen workouts, built-in GPS, continuous heart rate, run detect and more. Ionic was designed to elevate your fitness experience. Use your music as motivation - Ionic stores and plays 300+ songs, including playlists from Pandora, giving you the extra edge when you need to tackle tough workouts. Better battery, more convenience - get instant access to your favourite apps, key notifications like calls and texts, and make payments from your watch, all with a 4-day battery life. 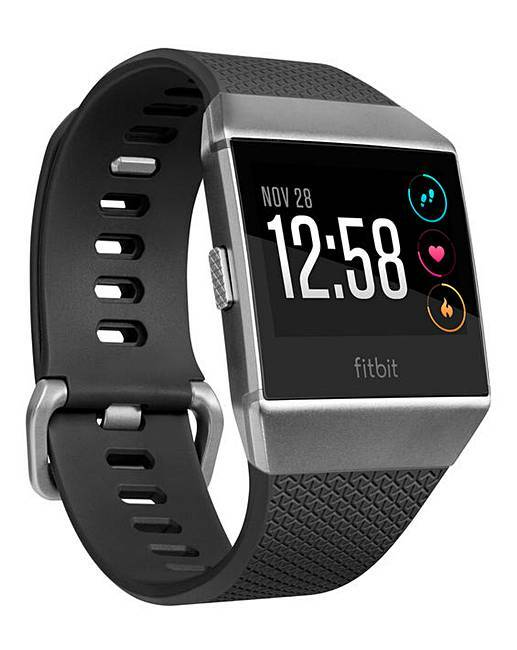 Features include dynamic personal coaching, store and play music, built-in GPS, Purepulse heart rate, water resistant and tracks swims, multi-day battery, popular apps and notifications, makes payments, all-day activity, sleep stages and Insights, multi-sport and smarttrack, interchangeable bands, wireless syncing.